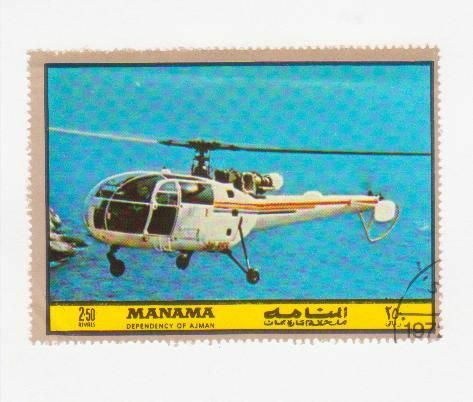 Alouette 3 on Mi 1084 of Manama. 1972 Aircraft series. "The Bell Boeing V-22 Osprey is an American multi-mission, military, tiltrotor aircraft with both a vertical takeoff and landing (VTOL), and short takeoff and landing (STOL) capability. It is designed to combine the functionality of a conventional helicopter with the long-range, high-speed cruise performance of a turboprop aircraft." 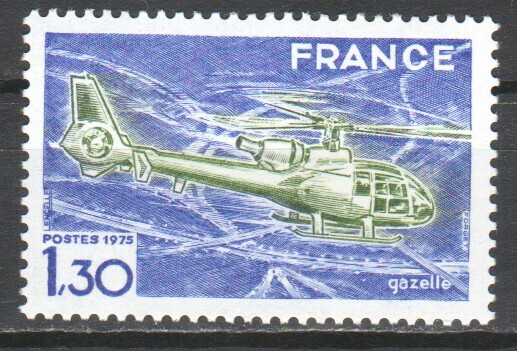 A 1975 French stamp showing a Gazelle helicopter. Initially it was jointly manufactured by French and British companies. Its use has been military - for scouting and light attack. 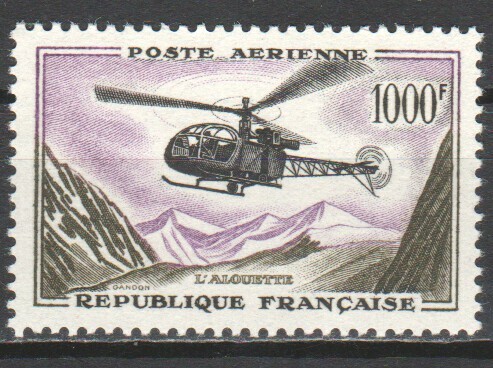 An Alouette II helicopter on a 1957 French stamp. It was the first helicopter to go into production with a gas turbine engine. The prototype had its maiden flight in 1955. In the summer of 1956 an Alouette II was the first helicopter to make a mountain rescue of someone who had suffered a cardiac arrest at over 4000 metres. It was used for both military and civilian purposes, and was the first model of helicopter to be given anti-tank weaponry. Nicaragua Scott #1713 issued June 1, 1988. Nicaragua Scott #1715 issued June 1, 1988. 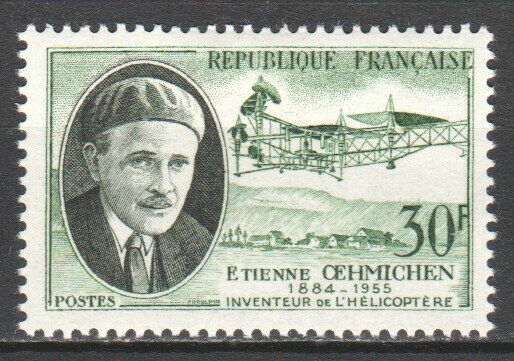 Étienne Oehmichen (1884-1955) and one of his helicopters on a 1957 French stamp. In 1922 he designed what was probably the first reliable helicopter capable of manned flight. In 1931 he invented a four-propeller blimp (a type of airship) able to take off, fly and land without crew. He was also an expert on wing function in dragonflies.